Quest Metal Detectors has released its first new metal detectors Quest Q20, Quest Q40 and Quest PRO! While the first two models are perfect for newbie seekers, the Pro version is high quality enough to meet the need of experienced treasure hunters on different terrains. But wait a minute… It reminds me of something… New Minelab Equinox series? Really? They look like Equinox 600 and 800! Quest metal detectors have a good price-quality ratio. Decent supply kits with headphones, bag, find pounch, cap and small plastic shovel as a gift (that’s a really awesome supplement for your metal detecting equipment!). Lightweight, interesting design, simple navigation menu, huge displays, flashlight, capacious batteries are the most distinctive qualities of Quest metal detectors. 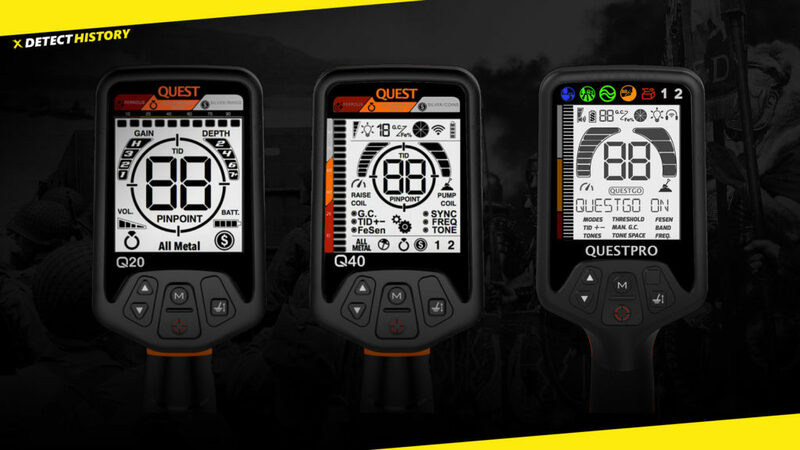 Quest Q20 has three composite foldable rod and control box, which are very similar to Minelab Equinox. The length of the metal detector shaft is adjustable, from 80 cm to 130 cm. There is a built-in 1200 mAh Li-Po battery. Its claimed battery life is more than 20 hours. Quest Q20 the simplest version in the series. Can it be a competitor for Garrett ACE 200 and Garrett ACE 300? The main differences from the previous Quest Q20 model are the frequency increased up to 13 kHz, and more powerful built-in 2000 mAh Li-Po battery. Its claimed battery life of more than 30 hours.